Even with engaging content and a killer email newsletter strategy, some subscribers will either never open an email from you, or simply lose interest in what you have to offer over time. I recently reached 20,000 subscribers, and had NEVER cleaned out my email list. And if you haven’t either (even if you just have 1,000 followers) – you NEED to. What matters is how engaged your subscribers are, now how many you have. It’s all about engagement! 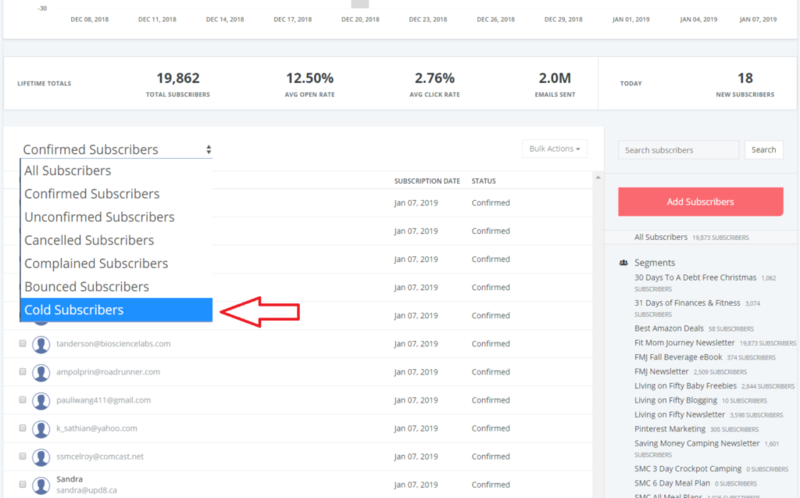 Inactive subscribers can also be known as “cold” or “dead.” And those subscribers that are cold haven’t opened an email in the last 90 days, and has been subscribed for 30 days. 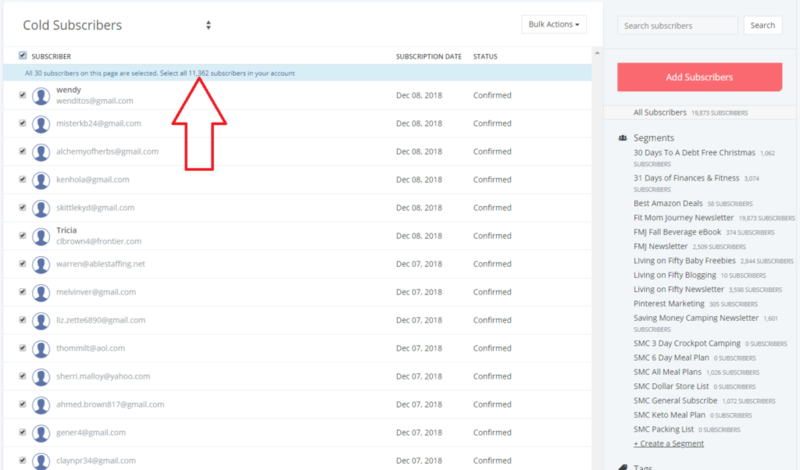 Unfortunately, because of how open rates are calculated, there can be mistakes made when showing someone as a cold subscriber, so I’ll show you how to remove cold subscribers, while still giving those subscribers who are actually interested in your email a chance to stay subscribed. Quick note: ConvertKit is my email provider of choice, and what I’ll be using for screenshots in this tutorial. If you don’t use ConvertKit, I could not recommend it more. You can find out more about how easy-to-use ConvertKit is right HERE. Check the checkbox to select all subscribers, then in the blue bar that pops up, click the “Select all subscribers” link. This is very important because often subscribers are labeled as cold, even when they aren’t. For example, a lot of email providers determine that an email was opened when 1px of an image in an email was loaded. But if someone is reading your emails but has images disabled in their email account, the fact that they’re reading the email won’t register. So, you’re going to create a Tag called “Cold Subscribers” by scrolling down to “+ New Tag” on your right sidebar in ConvertKit. 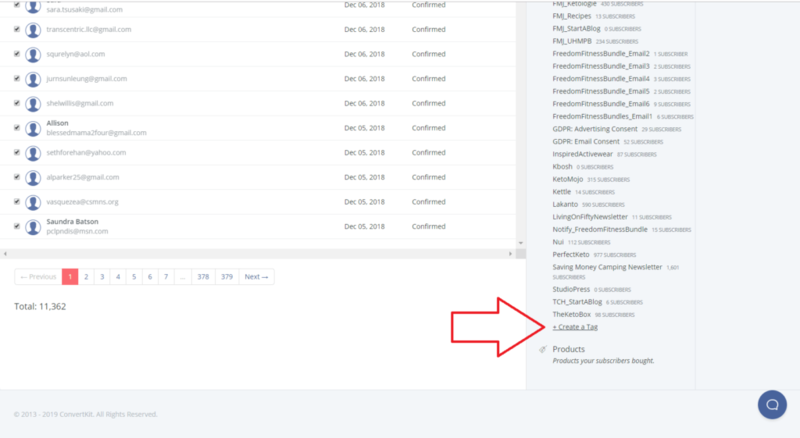 Then, add all those Cold subscribers you selected early to that tag by clicking “Bulk Actions” then “Tag” followed by selecting the Cold Subscribers tag you just created. Now that you’ve added cold subscribers to the Cold Subscriber Tag, you’re going to create an automation that gives subscribers a chance to stay subscribed before being removed. You’ll use the trigger of clicking a link, which will cause them to be removed from the Cold Subscribers Tag. Of course, you’ll need to add your link, as the one that trigger the removal of the Cold Subscriber Tag. 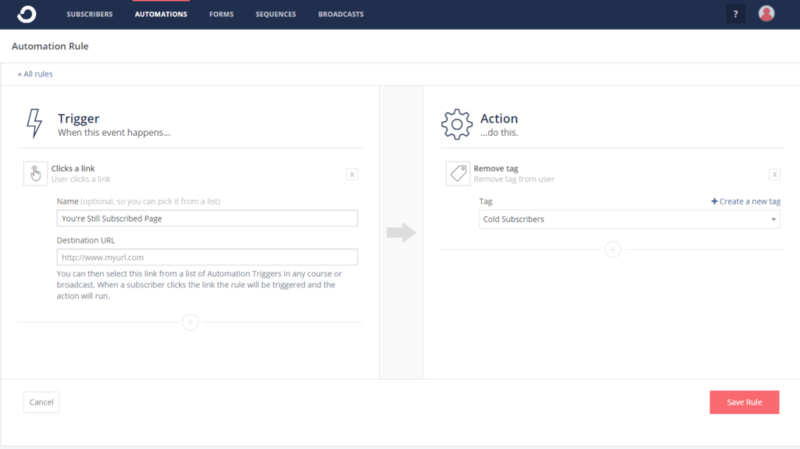 Once this automation is in place, you’ll send an email to everyone under the Cold Subscribers Tag, asking them if they want to stay on your list. I want to make sure that I’m only sending emails to my readers who are getting a lot of value from them. So I’m removing everyone who isn’t engaged from my list. My stats show that you fall into that category… Is that true? If so, no action is required. You’ll get removed sometime next week. But if you’re freaking out right now thinking “Wait! I love your emails!” Then just click the link below to stay on my list. Then, create a page on your website that says “You’re still subscribed! Glad to have you!”, and place the link to that page as the Trigger in your Automation, and the [Link] in your email. Select your cold subscriber group for this email to go to, then hit SEND. Now, you can create a cold subscribe re-integration workflow by copying this one with just a click! Lots of people will say they still want to stay on your list by clicking the link. You’ve set up an automation to remove them from the Cold Subscribers tag when they click. Wait a week or two after sending the breakup email to give them a chance to stay subscribed. 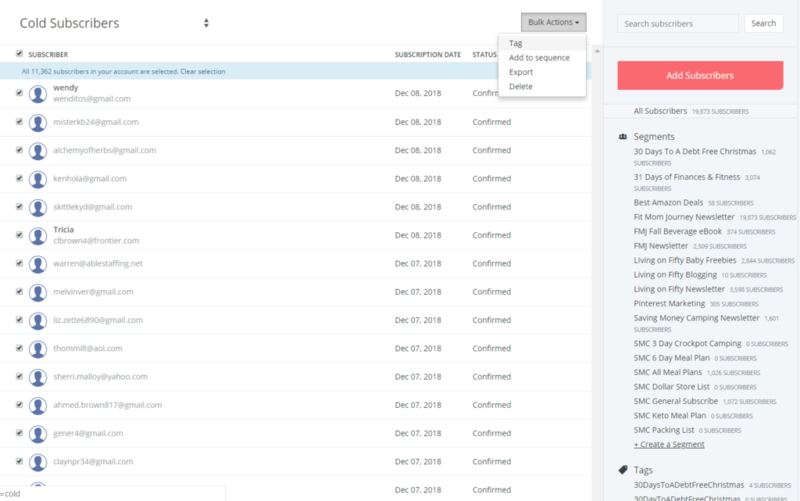 After the time has passed, bulk select all of your tagged Cold Subscribers, and delete them. Now, you open rates will be higher, even though you total subscribers are lower! I recommend that you remove cold subscribers about once per month in order to keep your list active and engaged. Any other questions about email list or removing subscribers? Drop them below!